Congratulations go to my dear friend Robin Woods, who is almost single-handedly responsible for my interest in birds (and especially in the odd, charming predator known as the Johnny Rook). On September 10, while SW was playing in Amsterdam, Robin was awarded the honor of an MBE (Member of the British Empire) for his decades of work on behalf of the islands’ wildlife. He was presented with his medal by the Governor of the Falklands at Government House in Stanley (where he chose to receive it, rather than at Buckingham Palace), and returned to field work the following day. Though a UK resident, Robin’s been traveling to and working in the Falklands since he was a lad of twenty in 1956, and has written or co-authored clear, careful, and authoritative books and articles on the islands’ unique and frequently overlooked flora and fauna. He also helped found and nurture Falklands Conservation, a local and UK-based organization dedicated to the preservation of Falkland wildlife. He wouldn’t care, but I’d like to remind Robin that this honor puts him in the company of Edward Heath, Ian Anderson, and Ringo Starr. 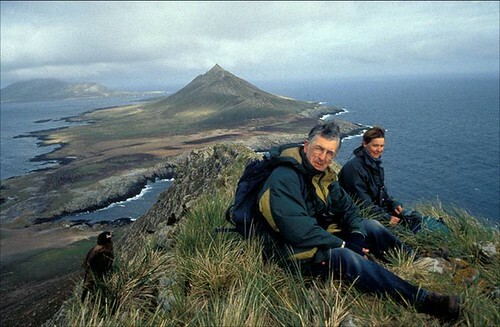 For my part, I’ll never forget accompanying Robin in the field on the Johnny Rook surveys of 1997 (when I snapped the photo above, on top of Steeple Jason island) and 2006, and struggling to keep up with him as we tramped the rugged coastlines of the Falklands’ outer islands. You can catch a few glimpses of Robin in the Looking for Johnny Rook videos, Alwych notebook in hand, binoculars around his neck.